Transmitters have always been the talk of the town with Wavacís 833a to Kondo San infamous 211 Ongaku. Many diyers have often long for amps like this. After my stint with an 845 amp, I decided to make myself a transmitter amp. It was the looks and the powerful sound of the transmitter that got me going. However the sound was thin and lifeless for me so I decide to make an amp that could beat a commercial offering hence the quest for my FIRST Transmitter Amp. Should I call it Simple Transmitter Amp perhaps? So enough of theory, I went and bought myself a quad of GM70 in lieu of building a PP for it. Of course with any transmitter amp you need yourself a relatively meaty driver. After some searching on the net I found a lovely pentode called 12GN7A. It has a Transconductance of 36mV. When triode strapped it has a mu of 40 and an Rp of 2K. Of course no curves are available for the tube; I had to test the tube to get the mu and the Rp of the tube. But why go for 12GN7A when 6c45 and 5842 are so easily available from Yeo? I find personally 6c45 is thin and solid state like when used as a driver while this 12GN7A has the Sonics of the 5687 neutral with a tinge of warmness in it. The tube also has a very weighty sound due to the low Rp of the tube and a high mu for use a 2 stage amp. What I like best is that the tube is can withstand 400V on the plate and has a12Watt dissipation. The tube is one hell of a driver looks like an el84 but with black plates. The driver was chosen as it can take a lot of voltage on the plate making it ideal for swing a decent amount of voltage. It has the capability to swing close to 80 Vrms when properly loaded that into a 10K load. With a 2K load, swing drops to 40Vrms. talk about meaty. Of course you could use it as a pentode and larger swings are appreciable. I know many people use this tube as a pentode and the love it. 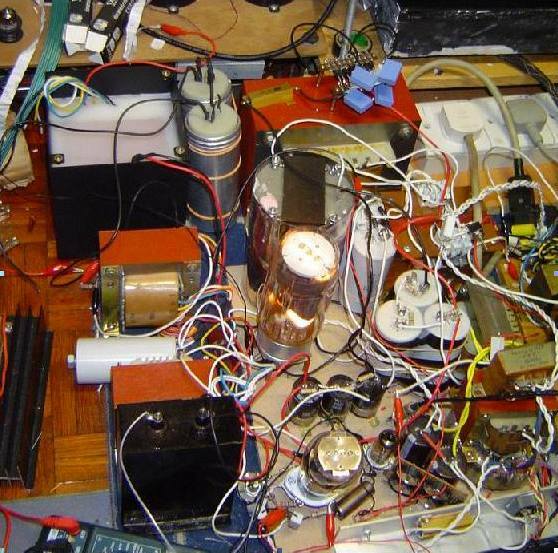 But I am a triode fan and choose to build it as a triode connected as I am to lazy to regulate the screen voltage. Other types of pentode that I have investigated are the 6688 but if possible another good driver to look into is the infamous D3A. However be expect to pay lots of many for this. Only made by Siemens and Halske or their derivative departments. Let me talk a bit more on the Gm70. It has a blardee large heater requirements of 60watts 20V at 3A. By turning on the heater only, the whole tubes glows and it is already hot this way. Imagine the heater is requirements is already hotter than the standard tiga ratus B. The mu of gm70 is 6.9 thus making it easy to drive unlike the 845 which requires a lot of swing hence the reason to choose the GM70. Easy to drive, more power and better looking. Best part of the Gm70 is that the Max plate Dissapation is 125Watt unlike the other smaller brothers 211 75 watts and 845 around 100W ( not advisable with Chinese unless the new 845BM is bought from China, not out yet). The plate of the GM70 looks much bigger than the 845 from Shuguang. However no such thing as free lunch, the tube is much cheaper than any other transmitters but requires a special base. The base can be bought from Dehavillean for only 150USD per pair or Teflon socket around 15 pounds per pair or just connect it with wires and use a capacitor clamp to hold it, another way is to modify a 6c33 base it would work too. When properly build with suitable drivers the GM70 has a power output of 48Watts Single Ended. This way diyers can break free from Single drivers and drive EStats perhaps and other conventional speakers that we all started on. However I use the beast to drive my Fostex 206 and really make it into a party animal now. So Coral owners get ready to build an amp that transforms your speakers into a wild animal. Attached above is the schematic for the first iteration of the GM70. Of course before we can run we must crawl first. The first iteration has a power of only 12-14 Watts only, thru a 9K transformer. Of course as time pass by I will release future upgrades to turn this amp into a truly might beast. But for now just stick with 14 Watts first. For those who would like to try this amp with a lower voltage reduce the B+ from 730V to around 450V. The power would be reduce to 8 Watts then but then it would give you a test of transmitter magic at a lower voltage. This amp deals with HT if you feel uncomfortable with it then build the 450V version. With the 450V used fixed bias instead with a voltage of -70 applied to the grid. This can be used with the 730Volts version too, by doing this reduce the B+ to 650Votls and use fixed bias. Fixed bias gives a more dynamic sound too. Here the 12GN7a requires the maximum gain hence the use of Choke loading for purpose of loading. This way the Mu of 40 is achievable and a low Rp of 2K is achieve. The low Rp is needed to drive the Gm70 properly. Of course plate chokes are hard to come but let me know if you need some as I have some. I am a big fan of Iron and Oil caps hence I when ahead and used Paper in Oil caps for C2. But any other brand is useable; I hear Mundofts are excellent for this. The output Trans was a 9K Trans that I design and got it wound. It has 8 layers of primary and 7 layers of secondary interleave for maximum coupling. The Trans that you should get should have this much layers at least because this would help to reduce the corona discharge in the trans. The Trans is wound using Z11 for best signal coupling. Of course it would be advisable to get a high power rating Trans so that it can be used when we convert the amp into a 48Watt Se. The Plate Choke was another of my own design using 6 layers to minimize leakage inductance and wound again with Z11. The rest of the parts in the Amp are pretty straight forward where the rating for C1 is 10Volts and C3 should be at least 200V. I used Siemens PolyProp here. C2 however should be at least 630Volts and above. I personally used 1KV here. This is because the voltage at turn on will be high around 730V and will drop to 250V later. Hence the cap has to be rated for that much hence the recommendation of the Mundofts here with their higher ratings. With any transmitter amp, the Power Trans design is the most critical, failures here would cause catastrophic damage. The secondary is a 540-0-540 here for the B+ of 730-750. Also I did not draw is the switch to ground at the CT of the 540 supply. This is turn on once the heaters of the tubes have been on for 1 minute. This way cathode stripping is prevented, nobody likes to crank 7000 rpm when the engine is still cold so treat the valves with care and they will outlive you this way. With a voltage of 20V there is not way AC heating can be used as the hum would be insanely loud. The heater of the GM70 is a DC heating with CLC to reduce the ripple in the heater supply. Of course this helps to act like a current source. Heaters like to see a Norton source (constant current) and not a Theiven source (constant voltage). They sound better with a current source heater supply. DC heating often gets a bad name when Theiven source is used with 317 regulating the voltage. The results are often dry sounding but not with a choke it sounds very AC like milky and sweet like chocolate au lait. A choke acts like a passive current source. Of course one could use an active CCS like 317 and co but remember at 3A, there a lot of heat dissipation to handle there and the chips would not less long this way. So I went ahead and use a choke instead. I recommend that the inductance be increase but this is what I have you instead. Values around 50mH would be better. However remember to reduce power loss the resistance should not be too big and should be rated for at least for 4Amps. Resistance of less than 0.5 R must be used. But the value of 15mH works fine too. Preferably the choke should be interleave and section to increase its capability to filter the HF hash emitting from the charging of the large filter cap that is needed to be used. The Sonics of the amp I would not lie to you, it is great with lots of potential. Feels like a very powerfully 300B and 2A3 amp. It has the nice midrange of the 300B but with the balance tonal of the 2A3. Bass control is excellent here and the amount of bass that can be pump out is insane for a SE amp; there is more high frequency extension with this amp then my 300b amp. What I like in particular is that at low volume and high volume the sonic character is the same. This trait shows the control and power sufficiency of the amp to control the speaker when both posh listening and the wild rocking head banging volume levels is played. The amp plays both rock and other music well. Ziggy Stardust by David Bowie plays now with me rocking in the middle. Because of good bass control, double bass plays with great authority. The expansion of the double bass is now very apparent like the how it should sound when you stand/sit 2meters away. Normally in most amps, the double bass is the often miss played instrument where the sound is muffled, not there at all, worst the box is heard but not the string being plucked. With this amp Charles Mingus is king and plays on. For the classis people, Moonlight Sonata LP never sounded better with the sound piano being like it was played in the moonlight where the pianist plays for you only. The decay of the piano sounds real like it supposes to be. Piano another great instrument for judging oneís amp has it as everything you need to judge an amp speed, dynamics, body, decay and etc. New World Symphony Largo LP Brass sections did not lack the speed and timbre associated with SE amps but it is noted that it is still slower than it should be. Because of the non-feedback the speed is not compromise where feedback tends to muddle with the speed as some of the signal is feedback to input thus slowing the sound. But with all SE amps there is more swing in orchestra pieces. Separation of the instruments seems to be good too and there clear audible distinct between instruments being played not just a sound wall. Endnote build the amp feel the music then get the itch to make it better with the next segment adding in the proper driver stage to drive the GM70. Till then rock on and smell the solder fumes remember no pain no gain unless you die trying.